, I am happy to share some tips on the Opportunities tab to ensure you're maximizing coverage for your clients this holiday season. Opportunities tab serves as a central location for easy access to budget and keyword suggestions, as well as other AdWords tools you've used before. The 'Budget Ideas' area will suggest you adjust your budget if your campaigns are missing out on valuable traffic due to budget constraints or increased click volume on keywords popular around the holidays. To help you decide, this section will demonstrate potential increased click and impression volume that would result from an increased investment. The 'Keyword Ideas' area will provide automatically customized keyword suggestions based on your client's website, account information, and actual searches on Google.com. Like the budget suggestions, you will be able to see the traffic increase that would result from including additional keywords. Since some suggestions are based on actual searches performed on Google.com, you may find some cost-effective long tail keywords to add to your client's list. 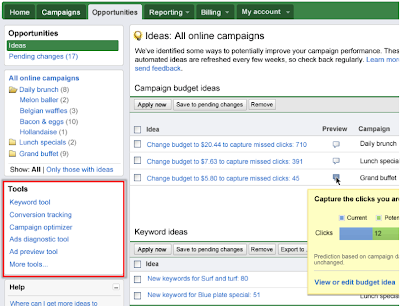 The tool will even suggest specific campaigns and ad groups in which to add these keywords. The best part is - you can add them right from the tab into the campaigns! You'll also notice that other familiar AdWords tools are available on the Opportunities tab on the lower left hand side of the page. You know your clients' businesses best - so please assess our suggestions with your clients' goals in mind. Finally, visit this tab often - we'll be refreshing suggestions every few weeks and adding new features soon! For additional information on the Opportunities tab, visit the AdWords Help Center. For the sixth installment of the Holiday Campaign Countdown series, I am happy to share some tips on the Opportunities tab to ensure you're maximizing coverage for your clients this holiday season.